Assembled for the aspiring outdoor photographer, the Canon EF-M 15-45mm f/3.5-6.3 IS STM Lens Landscape Kit from B&H comprises everything needed, besides a camera, to begin photographing landscapes. Included in this kit is the versatile standard zoom lens, a tripod and ball head, a backpack, a remote shutter release, a shoe mount bubble level, and a 49mm filter kit. 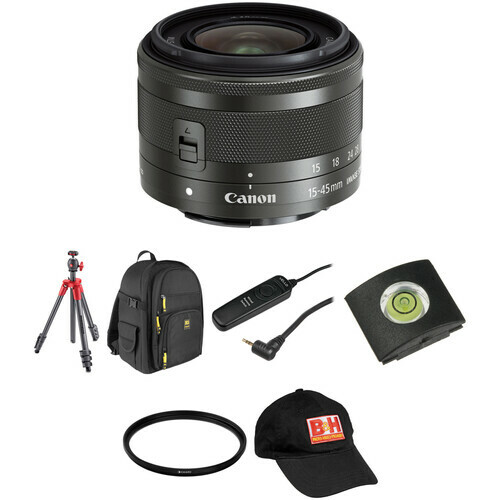 A standard zoom covering wide-angle to short telephoto perspectives, the graphite EF-M 15-45mm f/3.5-6.3 IS STM Lens from Canon offers a 24-72mm equivalent focal length range when used with APS-C-format EOS M-series mirrorless cameras. The optical design incorporates three aspherical elements, one of which is glass-molded and the other two are precision molded, in order to control chromatic aberrations and distortions throughout the zoom range. The lens placement has also been optimized, and coatings have been applied, to reduce flare and ghosting for increased contrast and clarity when photographing in difficult lighting conditions. Benefitting handheld shooting with slower shutter speeds, an Optical Image Stabilizer has been incorporated into the lens design to minimize the appearance of camera shake by up to 3.5 stops. A lead-screw-type STM stepping motor is also featured, which produces fast, smooth and near-silent autofocus performance to support both stills and video applications. For increased control, full-time manual focus operation is also available for making fine-tuned focus adjustments. Additionally, pairing well with the compact form factor of the EOS M-series of cameras, this lens also features a retracting design to shorten its overall length to just 1.75" long during travel and storage. Standard wide-to-short tele zoom lens for EF-M mount APS-C format mirrorless cameras provides a 24-72mm equivalent focal length range. One glass-molded (GMo) aspherical element and two precision-molded (PMo) aspherical elements are featured in the optical design, and help to reduce chromatic aberrations and distortions for greater sharpness and clarity. Optimized lens placement and coatings help to control lens flare and ghosting for increased contrast and color neutrality. Optical Image Stabilizer technology compensates for up to 3.5 stops of camera shake to better enable taking sharp handheld photos in difficult lighting conditions. The red Compact Light Aluminum Tripod from Manfrotto is a four-section camera support that can hold up to 3.3 lb. It extends from 15.4" to 51.6" and weighs 2 lb. The ball head on the tripod has a single knob to control all movements of the ball, and a quick-wheel to attach a camera to the 1/4"-20 threaded stud. A padded carrying bag is included to protect your tripod during transport. The black Outrigger 65 DSLR Backpack from Ruggard holds a DSLR with a battery grip and an attached 70-200 f/2.8 lens as well as four additional lenses and two flashes. All of this is held within the main compartment of the bag between padded dividers. It also accommodates an iPad or similar sized tablet inside a padded zippered pocket on the front flap. The backpack features two tripod straps with quick-release buckles at the base and numerous interior and exterior pockets. For carrying comfort, the back of the backpack is made from a breathable, small-mesh, padded material and features a padded shoulder harness. You can also carry the backpack using the nylon grip handle at the top. The backpack has a sternum strap and a hideaway waist strap. An attached rain cover for inclement weather can be hidden away at the base of the backpack. Whether you are shooting in the studio or outdoors, the Vello RS-C1II Wired Remote Switch provides photographers using select cameras featuring a 2.5mm connection with a simple way to control exposures and an easy-to-use tool to create more "keepers". The device is larger and more comfortable to use than many other remote devices, with a thick, sturdy cord. The RS-C1II is compatible with autofocusing, continuous shooting or single image capture, and long exposures. It will autofocus on a half press of the button and trigger the shutter with a full press. Also, users can press the button and slide it forward to lock it for long exposures. Since you can trigger exposures without touching the camera, you will capture sharp, blur-free images. Additionally, the unit does not require batteries as it draws its power from the camera, making it an extremely useful tool to keep in your studio or gear bag. The Low Profile Bubble Level from Vello is a bull's-eye bubble level that slides snugly into your camera's hot shoe mount. This conveniently placed bubble level helps you to align your camera for level horizontal shooting. Because it fits into your camera's hot shoe mount, it also serves to protect the shoe's electronic contacts from dust, oils, moisture and accidental impact, thus prolonging their effectiveness. The Tiffen 49mm Digital Essentials Filter Kit contains all the basics that an outdoor digital shooter requires. These are wise initial investments. They help protect your valuable investment from dust, moisture and scratches, which can lead to costly repairs. Neutral Density filters from Tiffen have several uses and offer the possibility to achieve otherwise unachievable results. They enable the shooter to adjust exposure without affecting color balance. ND filters appear gray and reduce the amount of light reaching the either the sensor of a digital camera or the film plane of a traditional film camera. Neutral Density filters are used to create some unusual special effects such as capturing the "blur" of the rippling water of a waterfall or the swirling effect of city traffic. Since they allow the use of slower shutter speeds in bright light, it becomes possible to create these special effects that would normally not be possible to capture without the filter. And since they can also help to control your depth of field, they permit you to shoot at wider apertures. Ultimately, their value is in helping to prevent bright, overly washed out images shot in bright light. The entire kit comes with a Tiffen padded storage pouch that will help keep your filters clean and free from dust, dirt, fingerprints and other contaminants,. Tiffen's ColorCore glass is produced through a process that entails permanently laminating the filter material in between two pieces of optical glass that are ground flat to tolerances of a ten-thousandth of an inch, then mounting them in precision aluminum rings. The B&H Logo Baseball Cap (Black) is an adjustable cap that can fit most head sizes. It has a B&H Photo-Video-Pro Audio logo on the front. The cap is made of 100% cotton. Box Dimensions (LxWxH) 5.4 x 3.8 x 3.7"
Box Dimensions (LxWxH) 18.189 x 4.173 x 4.173"
Box Dimensions (LxWxH) 16.0 x 11.0 x 8.5"
Box Dimensions (LxWxH) 6.1 x 4.4 x 1.2"
Box Dimensions (LxWxH) 4.0 x 2.5 x 0.5"
Box Dimensions (LxWxH) 8.7 x 4.0 x 1.7"
Box Dimensions (LxWxH) 9.5 x 8.8 x 1.4"